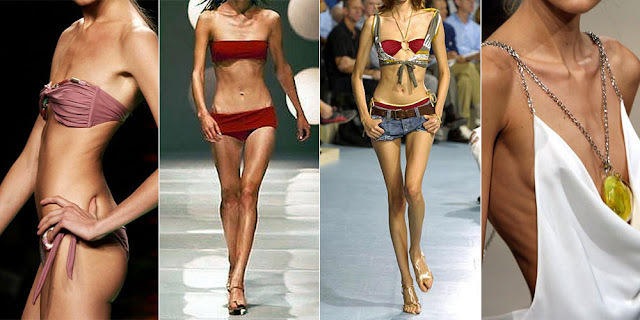 As from now on, a law banning the use of unhealthuly thin models has come into effect in France. In order to be booked for the runways and showrooms, models are required to provide a doctor's certificate attesting to their overall health and proving their body mass index (BMI) sits within a healthy range. Model's measurements will be compared to the World Health Organisation's definitions of what is underweight to determine whether or not a model is certified. In a bid to fight eating disorders and inaccessible ideals of beauty, France's minister of social affairs and health, Marisol Touraine, said the documents would be valid for two years "attesting that their state of health is compatible with their work." "Exposing young people to normative and unrealistic images of bodies leads to a sense of self-depreciation and poor self-esteem that can impact health-related behaviour," she added. "These two texts aim to act on body image in society to avoid the promotion of inaccessible beauty ideals and to prevent anorexia in young people." "The objective is also to protect the health sector of the population particularly at risk - models." The final law, back by MPs in 2015, allows doctors to decide whether a model is too thin by taking into account their weight, age and body shape. Those employers who violate the new rules could face fines up to 75,000 euros and up to six months in jail. Italy, Spain and Israel are among the other countries to bring in laws againt extremely thin models.